BMH books publisher Terry White (standing) was among those present at a special reception during the recent International Christian Retail Show in Atlanta honoring authors Tim LaHaye (seated at left), and Jerry Jenkins (seated, middle). Jerry Jenkins’ wife, Dianna, is seated at right. 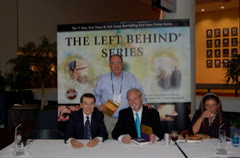 The Evangelical Christian Publisher’s Association recognized the monumental achievement of the Left Behind Series (Tyndale House Publishers) in Christian publishing at the recent CBA & ECPA Awards Celebration in Atlanta with the ECPA Pinnacle Award. Authors Jerry Jenkins and Tim LaHaye were present to accept the award, which honors the impact the series has made with total sales surpassing 65 million copies. The series, which started in 1995 with the first novel, includes 16 titles in the adult series, juvenile novels, audio books, devotionals, and graphic novels. Seven titles in the adult series have reached #1 on the bestseller lists for The New York Times, USA Today, and Publishers Weekly. In addition to his work with BMH and BMH books, White has been a mentor with the Jerry B. Jenkins Christian Writer’s Guild for the past five years. The Guild, which was begun by Grace Seminary alumnus Norman Rohrer, has trained thousands of aspiring writers through mail and online courses in which mentors critique and guide students through series of writing lessons.